#Can’twait for the UPDATED Rankings#WeElite….. Lets go Won the Reno Tourney- We Won the San Diego Top gun Tourney beating the Number1 in GOLD….. Moving UP… Lets Go….. It would be a wonderful thing and good for the game if the kids were the right age! Being 16 in the 7th grade? No wonder they are unbeatable. Come on coaches, respect the sport! EBC Colorado is designed to feature the top players competing in quality training and games. West Coast Elite 25 ? Great games at MLK Aces 2016. Congrats to Team Dream for winning it all! Lots of heart. Wow. Proved they are best 7th grade (w/ holdbacks) team. Took down the headline squads one at a time. Impressive. Looking at true (of age only) 13U teams — is there anyone better than BFT? Not to this watcher. These kids go to school, or are they coached all day? Athletic and disciplined. FBC ranked too low. Potential there. Be on the Lookout for 13U Dojo Nation. Seattle warriors beat Seattle rotary you guys should change this. NO RC BULLS ??? Wow i guess they will just keep winning. Could u imagine what it would be like to see only 13 year olds in 13u???? I guess that would take honesty lol lol. We beat Vision Elite in the following tournaments: BAS MLK Tournament and the Oakland Rebels Finest Easter Invitational, which are both ranked tournaments. 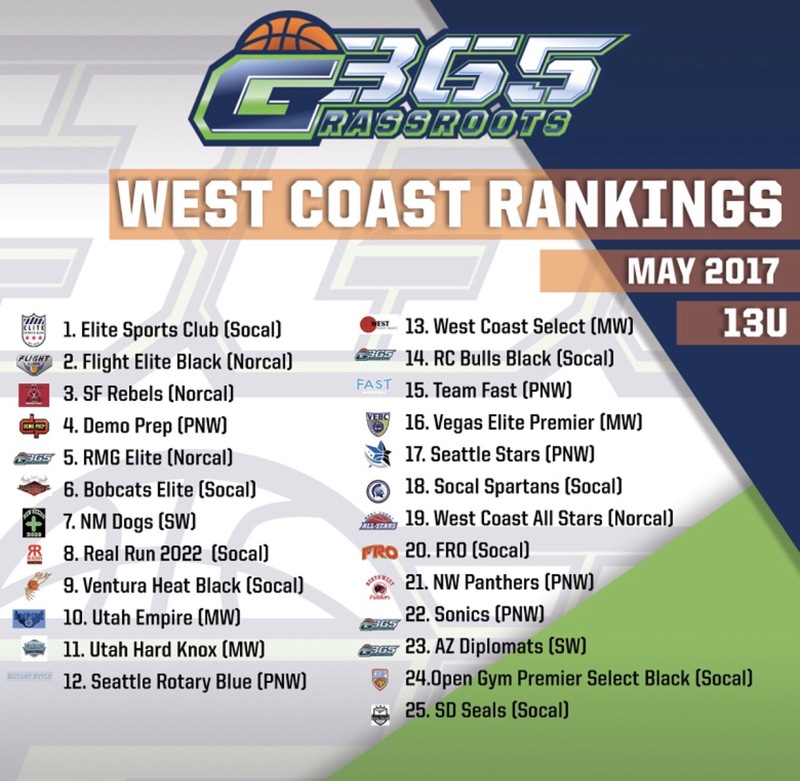 We feel Vision right now is by far the best team in the Bay Area, so we should be ranked one or two spots behind them. We beat the Norcal Spartans by 20 twice in the Oakland Rebels Invitational and Yellow Jackets Capital Classic. And where are our rivals the Oakland Rebels? They should be right beside us. Saw West Coast All Stars 2021 beat the Carolina Wolves at NYBL Session II in FL. I was highly impressed and wanted to do a write up until I talked to several of the members of the team that informed me of their actual age. Still a good win, just less impressive now. ARC 13s elite not rank !!! Wow , I bet they would blow out all true 13s anytime , any day !!! I see BFT as best true 13s. And I’m told they did a number on ARC last times the teams played. Team phillips out the BAY go hard too! Took down BFT 14u in Vegas with the heroics of SG Class of 2021 Jaden Phillips.